The local school is closed again due to the cold icy rain. That means kids are home and board out of their mind. Although I would love them being at school so that I can find my peace at home, I kinda like having them at home occasionally. On the dreary weather day like this? 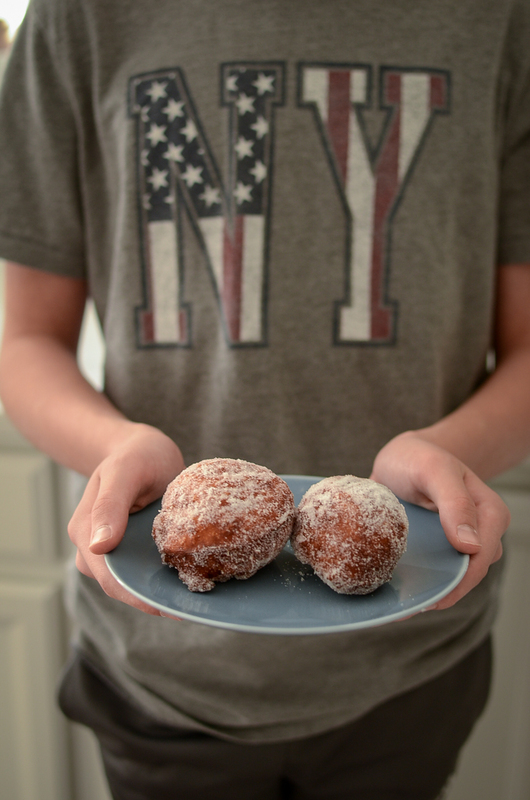 We make Malasadas (Portuguese donuts). I had malasadas for the first time in Hawaii several years ago. My sister bought some from the famous Leonardo’s bakery. I loved it. They were not the kind of fancy donuts adorned with coatings, toppings, or whatever you see in the famous doughnut shops these days. They were like plain basic fried dough. But boy, weren’t they good! 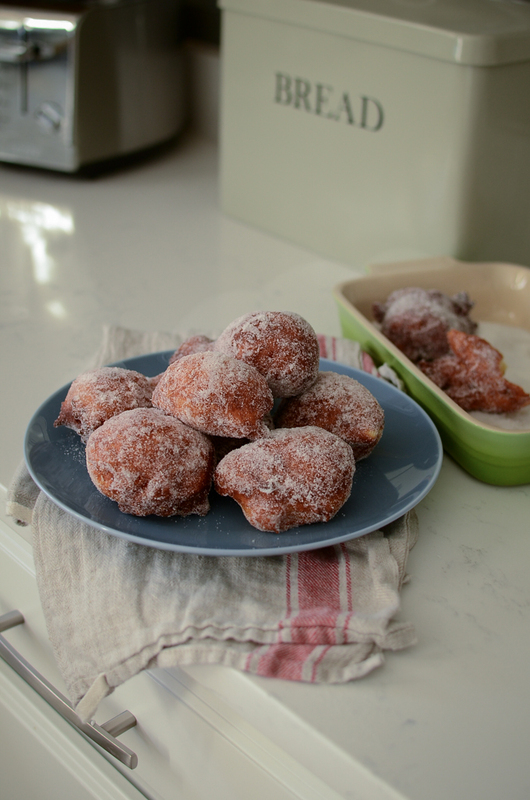 The soft and chewy texture of warm malasadas were so satisfying. Ever since I tasted, I had been making them around the winter time every year. The dough is very sticky, that’s why it creates soft and melt in the mouth texture. I use a muffin scoop to scoop up the dough. It makes the job much easier. You have to watch for the oil temperature. 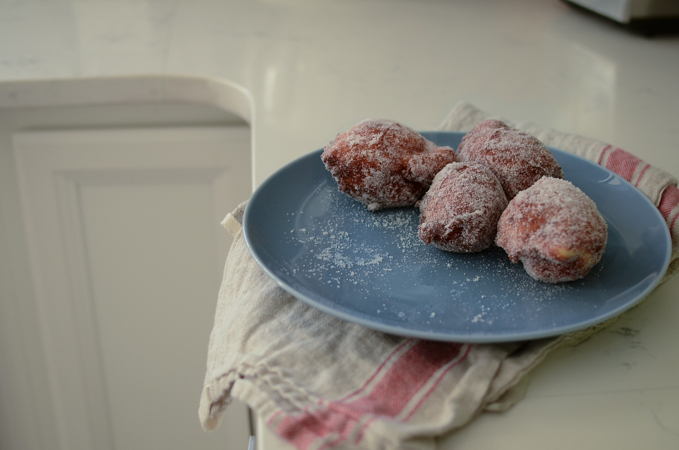 You can easily burn the outside of malasadas with the insides still remaining raw. I don’t use thermometer for frying. I just keep the flame on med-low heat adjusting frequently. It takes about 1 minute per side. The granulated sugar coating makes a big difference. I love the contrast of crunchiness outside and softness inside. You can’t just have one malasada and quit. They are just too good to eat only one. Such a humble treat to make everyone smile. We usually devour them all in a single sitting. So be aware! In a large mixing bowl, combine flour, sugar, salt and yeast; mix well. In another bowl, whisk together milk, melted butter, and eggs. Add the milk mixture to the flour mixture; stir well. The dough will be very sticky. Cover the bowl and let it rise in a warm place until double in volume. 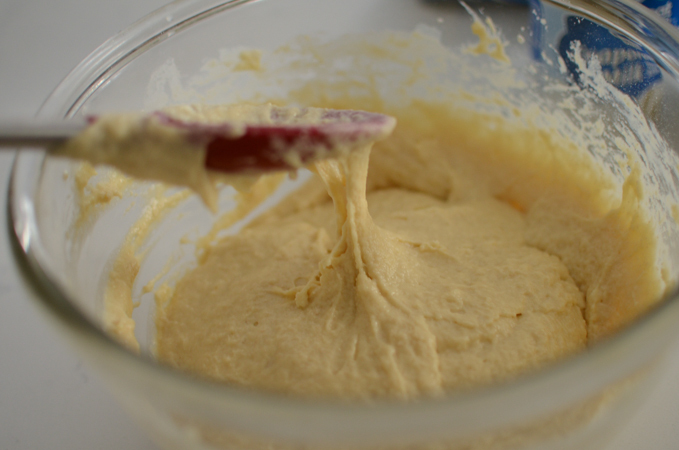 Deflate the dough and mix with a wooden spoon, rest for 2-3 minutes. Meanwhile heat oil over med-low heat. Test with a small piece of dough to see if the oil bubbles up. 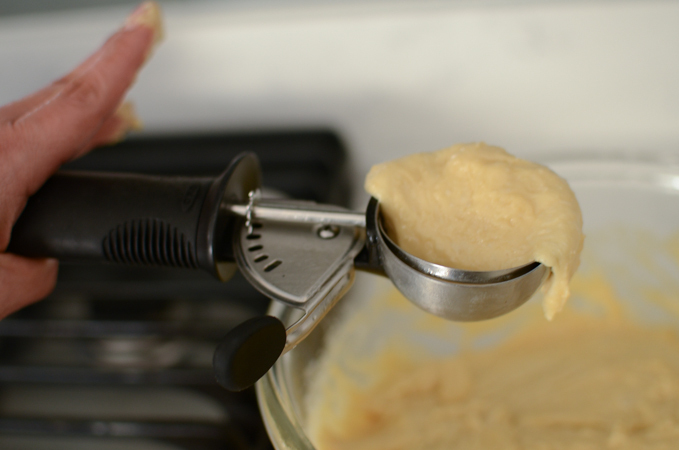 Using a cookie scoop or muffin scoop, scoop up a dough and drop in the oil. Fry until deep golden brown on the surface, then flip to the other side and fry again. 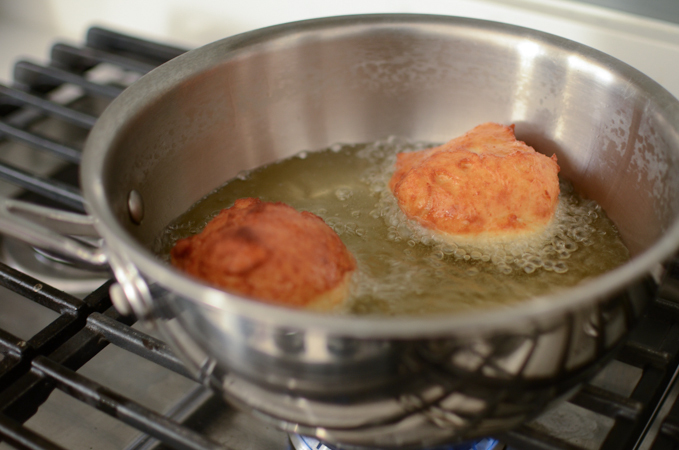 Frying time can depend on the size of the dough. Adjust the heat level if needed. Transfer the donuts to a paper towel lined plate first to remove excess oil, then coat with sugar. Serve warm. The donuts can harden a little bit as they cool. Wish I were young enough to eat some fried stuff. So very tempting! Mmmm, donuts! Love 'em, and almost never make them myself. Great recipe -- thanks. HOLLY, I HAVE A SIMPLER RECIPE FOR MALASADAS. YOU WOULDN'T KNOW THE DIFFERENCE 1 1/2c. bisquick, 1 tsp. B.Powder, 1 T. sugar, 3/4c. milk. 5 slices (square) sandwich bread remove crust and cut into 6-9 squares (fresh bread not couple days old) dip into batter, fry and shake in bag of sugar-- can add cinnamon in sugar. This is what some church's use for their bazaar's, and fairs. Thanks for the recipe. Sounds really good and quick. I will try out soon.